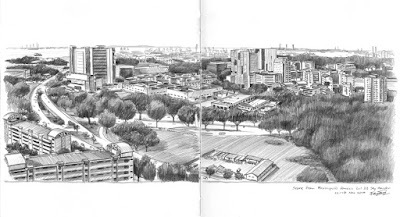 This book was the initiative of a bunch of friends I got to know through Urban Sketchers Singapore. 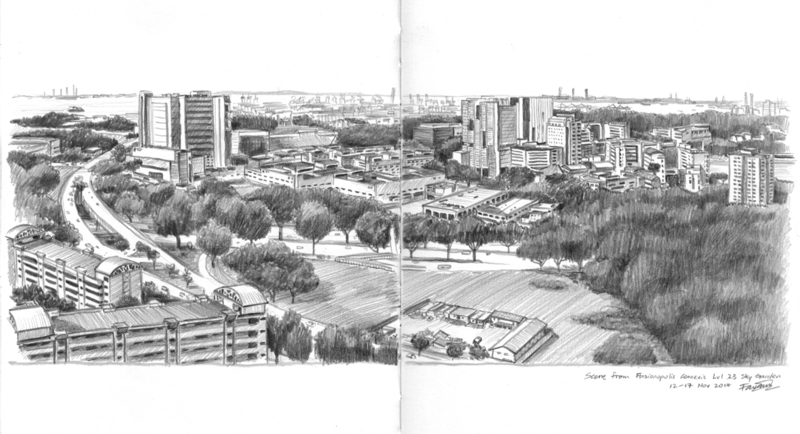 With the help of the SG50 Celebration Fund, we produced a book of sketches and stories of our familiar neighbourhoods. For my piece, I went to the top level Sky Garden of Fusionopolis where I was working then. For about 4 mornings before work I went to the office early to sketch a panoramic view from the Sky Garden overlooking the National University of Singapore, Ayer Rajah Expressway and Industrial Park, and some parts of Buona Vista Road and Dover Road. I used pencils, one of my favourite media. to take the photo for us and we took 2 shots - each with only 1 of us in it. Handover photo 2 with my answer to the question above.